No employer wishes to get on the bad side of the Department of Labor, and, more specifically, OSHA. 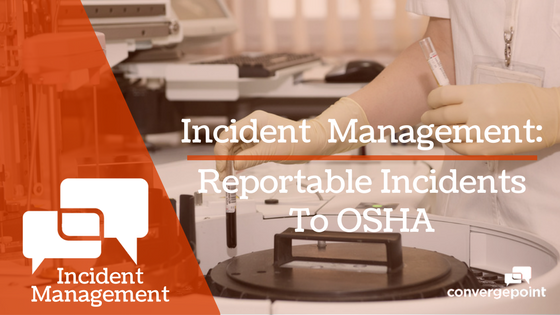 That is why it is important for any safety/EHS professional to be fully aware of what incidents (or accidents) must be immediately reported, how they must be reported and all allied issues and requirements. Whilst this information should be well-known to safety/EHS professionals, as well as being readily available on the OSHA website, it is nevertheless worth succinctly covering in this short article. In what instances is it mandatory for an employer to contact the nearest OSHA field (area) office? There are four specific instances or scenarios that make reporting automatically necessary, namely (1) an employee killed on the job, (2) hospitalization due to a work-related incident, (3) loss of an eye or (4) amputation. What constitutes ‘hospitalization’ can be tricky in certain situations, therefore the OSHA definition should be the decisive as the agency views hospitalization as “a formal admission to the in-patient service of a hospital or clinic for care or treatment.” Therefore, treatment that occurs only in an emergency room (ER) is not reportable to OSHA. The word ‘amputation’ can also be tricky, hence the importance of the definition provided by OSHA, i.e. that an amputation is “the traumatic loss of all or part of a limb or other external body part. This would include fingertip amputations with or without bone loss; medical amputations resulting from irreparable damage; and amputations of body parts that have since been reattached.” If there are doubts, an employer should (and can) rely on the diagnosis of a medical practitioner for this purpose. Reporting needs to be within 8 hours for a death on the job (as long as the fatality occurred within 30 days of the work-related incident), with the other three scenarios needing to be reported within 24 hours (as long as they occurred within 24 hours after a work-related incident). If the OSHA area office is closed, OSHA makes it clear that the employer is still obliged to call 1-800-321-6742 in order to report the given incident. It’s best to keep that number very handy. The worst of incidents often occur at the worst of times. As for who exactly should report any one of these incidents, OSHA too is very prescriptive: as with any section 1904.31 requirement (i.e. as statutorily mandated with regard to the recording of injuries and illnesses on the job), the employer that provides the day-to-day supervision of the worker is the person who must report any one of the aforementioned incidents to OSHA. This reporting requirement is fundamentally the same for temporary workers who may be killed or injured (as prescribed above) on the job as it is for full-time employees. This 24-hour maximum reporting rule for these four expressly defined reportable incidents only came into effect on January 1st, 2015. However, as reported by Rogers Insurance Agency, there has already been a marked rise in the number of incidents being reported to OSHA. This trend was confirmed by Dr. David Michaels, the assistant secretary of labor for OSHA, who made the further comment that the rule had enabled OSHA to, “impact a larger number of employers than we would have with simply doing inspections.” It’s clear: the proper and timely reporting of serious incidents has never been more important for safety/EHS professionals. Improve facility management, student health and safety, workforce and administration training, and related incidents. Adhere to federal regulations, administer employee training programs, and enhance hospital facility management. Upgrade facility management and safety measures, diminish workforce injuries, and enhance employee training programs. Manage employee complaints and working conditions, injury reports, accidents, and improve compliance training programs. Increase training program effectiveness, reduce workplace injuries and complaints, and meet FTIC and SEC regulations. Abide by stringent government regulations, provide proper safety training programs, and mitigate workforce and onsite injuries. Outline health and safety measures for drivers and pilots, abide by federal regulations, and communicate processes for hazardous materials (Hazmat). Visit our resource library for industry best practices and how our Health and Safety Management Software has helped numerous clients in your industry. Let us show you how our Health and Safety Management Software will strengthen your compliance program.